Contains 100 gram, suitable for about 100 m². This mixture contains 50% dead buckweat to ensure you will not sow to thick and is also a green manuring. 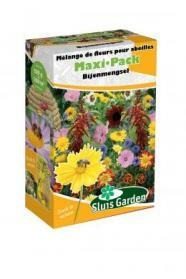 This mixture is specially composed to attract bees and other hymenopterans. The bees are in a difficult situation at the moment and need some help to increase and improve their population. The world needs a larger number of bees ! Contains:Brassica rapa oleifera, Coriandre, Calendula, Centaurée, Mauve, Nigelle, Phacélie, Bourrache, Aneth etc.